MOUNTAIN VIEW, CA -- 12/16/14 -- Today eHealth, Inc. (NASDAQ: EHTH) (eHealthInsurance.com), the nation's first and largest private online health insurance exchange, identified thirty-seven states in which at least one health insurance company is currently accepting health insurance applications for Affordable Care Act (ACA) coverage beginning January 1, 2015 beyond the standard December 15, 2014 deadline. December 19, 2014: States with at least one health insurance company accepting applications for January 1 coverage until December 19, 2014 include: Alabama,Arizona, Florida, Georgia, Illinois, Indiana, Kansas, Kentucky, Michigan, Missouri,Mississippi, North Carolina, Ohio, Oklahoma, South Carolina, Tennessee, andWisconsin. December 20, 2014: States with at least one health insurance company accepting applications for January 1 coverage until December 20, 2014 include: Texas,Maryland, and Virginia. December 21, 2014: At least one health insurance company in California indicates it is accepting health insurance applications for January 1 coverage until December 21, 2014. December 23, 2014: At least one health insurance company in Massachusettsindicates it is accepting health insurance applications for January 1 coverage untilDecember 23, 2014. December 24, 2014: States with at least one health insurance company accepting applications for January 1 coverage until December 24, 2014 include: Louisianaand New York. December 25, 2014: At least one health insurance company in Pennsylvaniaindicates it is accepting health insurance applications for January 1 coverage untilDecember 25, 2014. 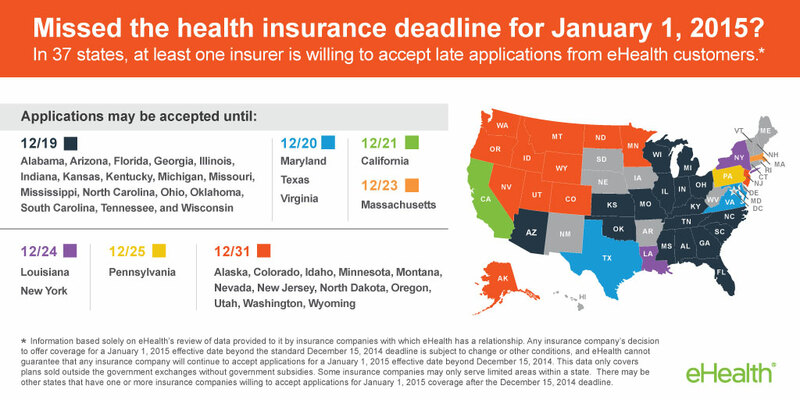 December 31, 2014: States with at least one health insurance company accepting applications for January 1 coverage until December 31, 2014 include: Alaska,Colorado, Idaho, Minnesota, Montana, Nevada, New Jersey, North Dakota,Oregon, Utah, Washington, and Wyoming. "December 15, 2014 was an important deadline for consumers who needed their coverage to begin on the first of the new year," said Carrie McLean, eHealth's Director of Customer Care. "Many health insurance shoppers may not know, however, that some health insurance companies have later deadlines in place that may allow them to still get ACA-compliant coverage by January 1, 2015. There are still options out there for some consumers who want their new health plan to start in January." While government-run health insurance exchange in some states (such as California,Idaho, Massachusetts, Maryland, and New York) have also opted to extend the application deadline for January 1, 2014 coverage, the information released by eHealth today pertains only to shoppers purchasing non-subsidized ACA-compliant coverage outside of government-run exchanges, through private marketplaces such as eHealth. Health insurance companies in other states may also decide to accept applications forJanuary 1, 2015 coverage beyond the December 15, 2014 deadline for January 1, 2015 coverage. Health insurance shoppers in the states identified above who still wish to enroll in coverage starting January 1, 2015 should visit eHealth.com to review their options and speak with a licensed agent or representative at eHealth's Health Insurance Hotline:877-803-2369. The current nationwide open enrollment period for individual and family health insurance began on November 15, 2014 and is scheduled to continue through February 15, 2015. For many consumers, this period may be their only chance to apply for premium subsidies and enroll in the major medical individual and family health insurance coverage they need for 2015. While serving the needs of consumers not utilizing subsidies, eHealth continues to enroll subsidy-eligible consumers in the majority of states served by the federally-facilitated marketplace and in its home state of California. * Information based solely on eHealth's review of data provided to it by insurance companies with which eHealth has a relationship. Any insurance company's decision to offer coverage for a January 1, 2015 effective date beyond the standard December 15, 2014 deadline is subject to change or other conditions, and eHealth cannot guarantee that any insurance company will continue to accept applications for a January 1, 2015effective date beyond December 15, 2014. Some insurance companies may only serve limited areas within a state. For more health insurance news and information, visit the eHealth consumer blog: Get Smart - Get Covered or visit eHealth's Affordable Care Act Resource Center atwww.eHealth.com/affordable-care-act.